They call it March Madness for a reason folks! The college basketball tournament that takes place each March/April is chaotic and can easily overrun your house if you have an avid sports fan living under your roof. Luckily there are ways to incorporate the fun of the tournament without making it the sole focus of your living space. Being able to turn the TV to one area of the room (and maybe even put it on mute!) can allow other conversations to take place in other areas. Consider rearranging your furniture to create two distinct living spaces. You can always move it back when the madness dies down. 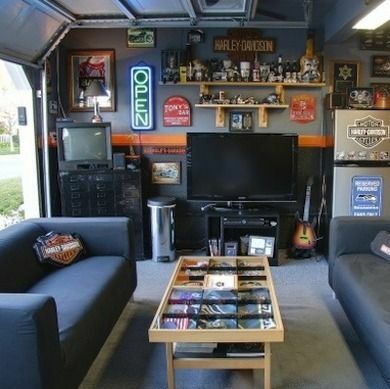 While you may not want a permanent man cave in your house (or maybe you do! ), you can create an awesome temporary viewing space for friends during the excitement of March Madness. It doesn’t need to be fancy, we recommend moving a TV into the garage and setting up lawn chairs and a cooler for drinks of course! The room pictured here has two TV’s which would be perfect for watching multiple games at the same time. 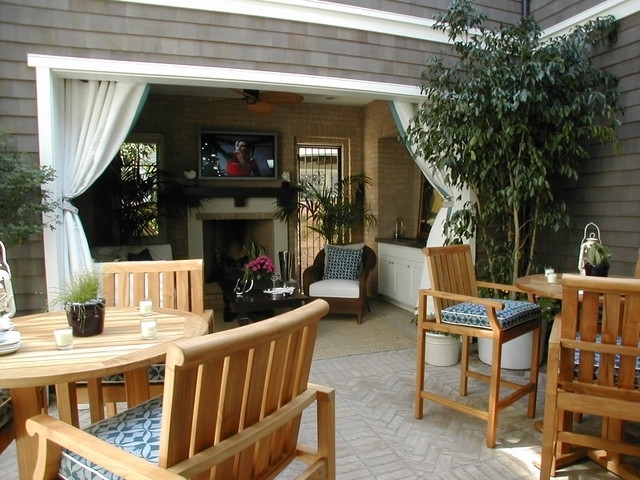 At Modernize we are obsessed with outdoor entertainment spaces and the ruckus that comes along with March Madness can certainly be better accommodated outdoors. While this may require a little more planning and probably more money, you can create a space that you will enjoy many months of the year, not just during sports season! Hopefully these ideas have given you the inspiration necessary to take the plunge and plan a party around all of the craziness this Spring. And whether you’re an avid basketball fan or not, be sure to check out OmniMount’s #BeattheBrackets promotion for your chance to win the OC80FM mount pictured above! Let the games begin! Guest post by Bryn Huntpalmer, editor for Modernize and Her Own Wings These days most families have a TV in their living room but many parents are also becoming more and more conscientious of how much screen time their children are getting. A great compromise is to incorporate a television in a way that doesn’t make it the center of attention. Entertainment Centers are bulky, unnecessary and have a tendency to make the television the center of attention in a living space. So ditch that oversized cabinet and replace it with a wall mounted solution. Create a gallery wall by adding your personal touches around the TV to keep the eye from focusing on a television that is powered off. There are so many clever ways to hide your television these days. Options range from hidden compartments in the wall, mirrors, paintings or even mock shutters. When deciding where to put your furniture feel free to step outside of the box and create a setup that doesn’t center around the television. A great way to accommodate this type of set-up is to mount your TV on a swivel mount so the television can adjust to the furniture rather than the furniture accommodating the TV. For more home ideas and inspiration please visit Modernize.com. How do you integrate technology in the home? Have a creative solution? We want to hear it! You have a new TV. Now what? Chances are you have a friend, or maybe it’s you yourself, that purchased a new TV and tried to make it fit into an old setup. There are a lot of reasons to consider accessories when bringing a new TV home. Not only can a product like a TV mount improve the safety of your home theater, it can also help you achieve lifestyle objectives, like improving the versatility of the TV and the overall design of the room. If you or your friends are guilty of placing a brand new TV on an old piece of media furniture, know that there is another way! OmniMount is here to help with the new eBook: How to Accessorize Your New TV.